Pancakes and noise music may not be the first combination one thinks of for a Sunday brunch. But that is precisely what is offered at Godwaffle Noise Pancakes, a monthly noontime show organized by Grux at The Lab in San Francisco. I had the opportunity to perform at the most recent event on March 3. I opted for a “purple theme” revolving around the purple Monorocket case I have for my Eurorack modular system. I selected an outfit and hair to match, and even found an old toy keyboard that was purple. The performance itself was on the subtle side, attempting to dial in on specific sounds and module combinations. It was an exercise in managing unpredictability and finding musical structures and phrases even in the noisiest of situations. You can see the performance in the video below. Godwaffle Noise Pancakes live performance, March 3, 2013 from CatSynth on Vimeo. The hall was quite dark during the set and my attempts to lighten the video resulted in a lot of artifacts. But it does complement the sound in a way. One take-a-way for future performances with the instrument is to be mindful of how one adapts the output of the small Eurorack jacks to standard live-sound systems. Investing in some strong audio adapters for the modular itself will cut down on some of those unpredictable pops. 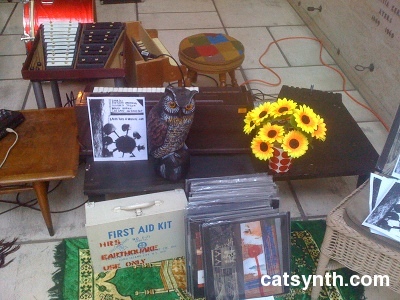 But overall I was quite happy with the set, and got a lot of positive feedback (about the visual as well as the aural). The next performance featured Abyss of Fathomless Light featuring Bert Bergen. His fast moving performance combined vocal recordings on a series of cassette players with analog electronics into a thick and fast moving soundscape. He was followed by fslux, whose performance moved between longer more mellifluous sounds featuring her vocals and harsh electrical output from effects pedals. The performance by J. Soliday (Jason Soliday) was undoubtedly the loudest and noisiest of this noise-based show. There were long sequences of repeated loud glitches that required a bit of effort to listen to, but also a few gaps and pauses with space for quieter detail. The final performance featured a collaboration by Wobbly and Thomas Dimuzio. I have seen them perform together before, but this was the first time with the technological combo of Dimuzio on analog modular and Wobbly on iPad and other digital synths. This was the longest performance of the afternoon (all the others including mine were quite short), but also the most captivating. They were able to create enveloping soundscapes that at times felt otherworldly and at others more meditative. The overall texture was lush, but there were dry moments with more staccato details from both the analog and digital instruments. Overall, it was a fun afternoon of music. I am glad I was able to participate and hope to do so again soon. The final concert of the 2012 San Francisco Electronic Music Festival (SFEMF) took place on Saturday, September 9 at the Brava Theater. If there a common thread among the different performances on this evening, it was the use (and celebration) of analog electronics. The concert opened with a solo piece by Chuck Johnson called Passivity and Void. 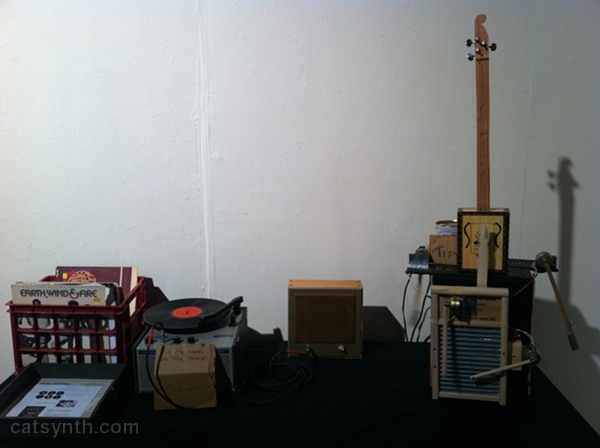 The performance featured analog electronics with steel guitar as a sound source, and explored the tension between retaining and relinquishing control over timbre and musical processes. This is particularly true of feedback and random voltages that Johnson used. The result was beautiful low-frequency drones with complex textures layered on top. I also found myself focused on his suitcase-based analog setup, similar at least in appearance to what I have been using of late. The next set featured James Fei using a large speaker, in particular an Altec 604, as a musical instrument in its own right. The large speaker, which is a model that has existed since the 1940s, is visually impressive. And the dramatic movements of its driver in response to the low and mixed frequency analog sound sources was a central aspect of the performance. Through his mixture of subtle long tones and more pointed elements, Fei seemed to imbue the speaker with a personality, expressing itself with motion and sound. It was fun to watch. As a purely sonic experience, the elements were simple, though not as minimalist as the piece’s title Sine of Merit would suggest. The final set of the concert and of the festival featured a collaboration of Peter Conheim of Negativeland and Jon Leidecker (aka Wobbly) appropriately called Negativewobblyland. They were joined for this performance by Don Joyce. Their performance, titled Booper Variations No. 18 and featured sounds and techniques based on Boopers, which were “analog feedback instruments created entirely from salvaged radio and amplifier parts.” Although the modern reinterpretation used samples and delays as forms of feedback, the music was based on the principles of the original Boopers. The result of sampling and feedback was a complex and varied array of electronic sounds and felt like a swiftly moving history of electronic music in a single set. The energy of the trio carried the music forward for the entire duration. Overall, this year’s SFEMF included several strong nights of music, and each of the nights was quite well attended. Additionally, there was a concurrent gallery exhibition, which I will review in the final installment of the series. A few weeks I go, I attended CCRMA Modulations 2011, an evening of live electronic music and sound installations by CCRMA (the Center for Computer Research in Music and Acoustics at Stanford) and special guests at SOMArts in San Francisco. The event was an eight-hour marathon, though I only stayed for about half the time, seeing many of the installations and most of the live-music performances. The first part of the evening featured sound sculptures from Trimpin and his students at CCRMA. This particular project, the “Boom Boom Record Player” by Jiffer Harriman stuck with me. The output from the record player is used to drive the electromechanical instruments on the right. I thought the instruments were well crafted – but I thought it was particularly fitting to have a classic Earth Wind and Fire LP on the record player. Trimpin’s offering featured coin-operated robotic percussion where the drums included just about every model of Apple notebook computer going back to an early PowerBook (and even earlier as I think I espied an Apple IIc). The live-music portion of the evening with Tweet Dreams by Luke Dahl and Carr Wilkerson. Audience members with Twitter access were encouraged to live-tweet messages to a specific hashtag #modulations. The messages were then analyzed in real time and the data used to affect the music. As I was planning to live tweet from this event anyway via iPhone, I was ready to participate. Of course, inviting audience participation like this is a risky proposition for the artists, as one cannot control what people may say. I will freely admit I can be a bit snarky at times and it came out in some of my tweets. The music was relatively benign, with very harmonic runs of notes – and I exhorted them to “give me something harsh and noisy”. Inspired by another participant, I also quoted lines from the infamous “More Cowbell!” skit from Saturday Night Live, much to the delight of some in the audience. The main changes in the music seemed to be in density, rhythm and some melodic structure, but all within boundaries that kept the sound relatively harmonic and “pleasant.” I would have personally liked to see (as I suggested via Twitter), more complex music, with some noisy elements and more dramatic changes. But the interaction with the music and and the audience was a lot of fun. The next piece, Sferic by Katharine Hawthorne, featured dance and electronics. It was described as “using radio and movement improvisation to explore the body as an antenna.” The dancers, dressed in black outfits with painted patterns, began the movement to a stream of radio static. The motions were relatively minimalist, and sometimes seemed strained. Gestures included outstretched arms and fingers pointing, with Hawthorne walking slowly as her dance partner Luke Taylor ran more quickly. Rich, harmonic music entered from the rear channels of the hall, and dancers moved to being flat on the ground. The static noise returned, but more crackly with other radio-tuning sounds, then it became a low rumble. The dancers seemed to be trying very hard to get up. Then they started pointing. The music became more anxious, with low percussive elements. The dance became more energetic and active as the piece came to a close. 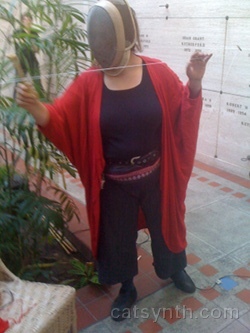 This was followed by Fernando Lopez-Lezcano performing Dinosaur Skin (Piel de Dinosaurio) a piece for multi-channel sound diffusion, an analog synthesizer and custom computer software. 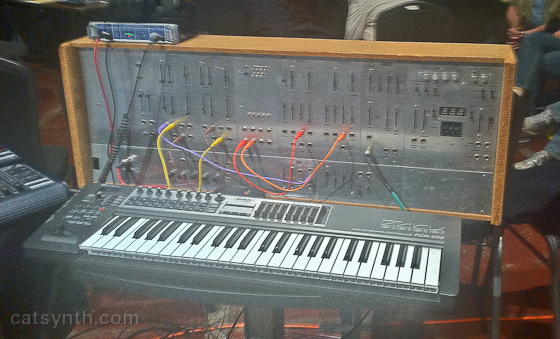 The centerpiece was a custom analog synthesizer “El Dinosaur” that Lopez-Lezcano build from scratch in 1981. The instrument is monophonic (but like most analog synthesizers, a very rich monophonic), multiplied for the purposes of the performance by audio processing in external software and hardware. The music started very subtly, with sounds like galloping in the distance. The sounds grew high in pitch, then descended and moved across the room – the sense of space in the multichannel presentation was quite strong. More lines of sound emerged, with extreme variations in the pitch, low and high. The timbre, continually changing, grew more liquidy over time, with more complex motion and rotation of elements in the sound space. Then it became more dry and machine like. There was an exceptionally loud burst of sound followed by a series of loud whistles on top of low buzzing. The sounds slowed down and became more percussive (I was reminded as I often am with sounds like this of Stockhausen’s Kontakte (II)). Then another series of harsher whistles and bursts of sound. One sound in particular started the resonant quite strongly in the room. Overall, the sound became steady but inharmonic – the timbre becoming more filtered and “analog-like”. The final performance in this section of the evening featured Wobbly (aka Jon Leidecker) as a guest artist presenting More Animals, a “hybrid electronic / concrete work” that combined manipulated field records of animals with synthesized sounds. As a result, the piece was filled with sounds that either were actual animals or reminiscent of animal sounds freely mixed. The piece opened with pizzicato glissandi on strings, which became more wailing and plaintive over time. I heard sounds that either were whales and cats, or models of whales and cats. 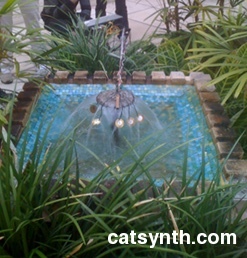 Behind this sounds, pure sine tones emerged and then watery synthesized tones. A series of granular sounds emerged, some of which reminded me of human moaning. The eerie and watery soundscape that grew from these elements was rich and immersive. After a while, there was a sudden abrupt change followed by violent ripping sounds, followed by more natural elements, such as water and bird whistles. These natural elements were blended with AM modulation which sounded a bit like a helicopter. Another abrupt change led to more animal sounds with eerie howling and wind, a strange resonant forest. Gradually the sound moved from natural to more technological with “sci fi” elements, such as descending electrical noises. Another sudden change brought a rhythmic percussion pattern, slow and steady, a latin “3+2+2” with electronic flourishes. Then it stopped, and restarted and grew, with previous elements from the piece becoming part of the rhythm. After an intermission, the seats were cleared from the hall and the music resumed in a more techno dance-club style and atmosphere, with beat-based electronic music and visuals. Guest artists Sutekh and Nate Boyce opened with Bands of Noise in Four Directions & All Combinations (after Sol LeWitt). Glitchy bursts of noise resounded from the speakers while the screens showed mesmerizing geometric animations that did indeed remind me a bit of Sol LeWitt (you can see some examples of his work in previous posts). Later in the evening Luke Dahl returned for a solo electronic set. It began calmly with minor chords processed through rhythmic delays, backed by very urban poster-like graphics. Behind this rhythmic motif, filtered percussion and bass sounds emerged, coalescing into a steady house pattern, with stable harmony and undulating filtered timbres. At times the music seemed to reach back beyond house and invoke late 1970s and early 1980s disco elements. Just at it was easy to get lost listening to Wobbly’s environmentally-inspired soundscapes, I was able to become immersed in the rhythms and timbres of this particular style. The graphics showed close-ups of analog synthesizers – I am pretty sure at least some of the images were of a Minimoog. I did find out that these images were independent of the musical performance, and thus we were not looking at instruments being used. I liked hearing Luke’s set in the context of the pieces earlier in the evening, the transition from the multi-channel soundscapes to the glitchy noise and to the house-music and dance elements. I was unfortunately not able to stay for the remaining sets. But overall it was a good and very full evening of music and technology. This September was the 10th anniversary of the San Francisco Electronic Music Festival, and I had the opportunity to attend two of the performances. To mark the occasion, many of the original participants in the first festival ten years ago came back to perform. The festival began with a piece by Miya Masaoka (whom Pamela Z jokingly referred to as the “mother of SFEMF” in her introduction). The LED Kimono project not surprisingly featured a kimono with LEDs, worn by dancer Mariko Masaoka-Drew. The dress itself was very pretty and simple, with a large LED array on the right-hand sleeve. Throughout the performance, different patterns were featured on the LEDa, sometimes very subtle with only a few active, and at other times large oscillating rectangular patterns. The music began with a very traditional koto performance. There some delay, sampling and pitch-shift effects in the background. The koto was mostly struck or plucked, and occasionally bowed. During the section of the performance, there was almost no dance movement. Over time, more electronics came in, initially low, dronaning, and with overtones that sounded vaguely FM or inharmonic, almost like electrical noise. As more electronic sounds came in, the dancer began to move, very slowly and subtly. Indeed, most of the movement throughout the piece was very subtle and slow, and did not clearly map to the musical material. On the other hand, the LEDs on the dress did match the rhythms and timbral changes. The first came on during and electronic arpeggio that sounded like classic FM synthesis. There were some dramatic swells with the higher FM-like sounds. The music primarily moved between the elements described, with the long drones and then the fast arpeggiation. But the physical movement of the dancer remained slow. As a result, I found myself mostly focused on the LEDs and the dress. And the end, I stayed to watch the process of Masaoka-Drew being “unplugged” from the dress, and to fully observe the amount of electronics (and wiring) that were required for it to function. The second set featured Lukas Ligeti performing his own compositions on the marimba lumina. He began slowly, with very low tones, one so low that the amplitude modulation itself became and audible rhythm. He then layered other sounds over these tones, including some vocal samples that sounded like chatters or whispers. Overall , I would describe his music as a cross between classic minimalism, world music, and electronic music. He described what we was doing as using the marimba lumina to play “samples and funny synths” on his laptop, with a focus on samples were collected from his world travels. One could definitely hear some of the instruments and voices from various places around the world, particularly Africa, in his performance. The final performance of the evening was by Amy X Neuberg. Her performance was a combination of her “electronic cabaret”, which we have heard several times before and reviewed here at CatSynth; and a new work entitled “The Dude Trilogy”, a series of abstract poems for voice and the Blippo Box. The Blippo Box employs chaotic oscillators and modulation, and can be very difficult to control in a predictable way. However, Neuberg manages to perform it in a very poetic way, and more remarkably is able to match her voice to the sounds of the synthesizer. Rapidly changing vowel sounds matched a fast chaotic filter modulation, the rhythms of spoken word material matching the sequences. At other times her high sung tones followed the unstable high electronic pitches. 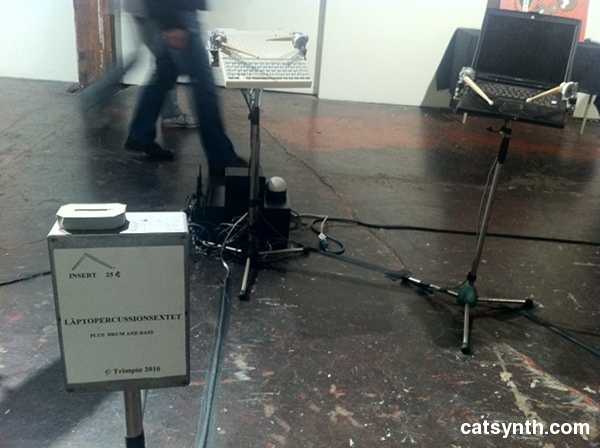 During the piece, a video camera recorded and projected close-ups of her hands manipulating the instrument, including its theremin-like antenna. Several of her electronic cabaret pieces were familiar from previous programs. They always are very tight and solid, combining voice, electronics and theatre. She did close with one song I had not heard before. It began with her striking the electronic drum pad repeatedly to produce a “banging piano-chord” pattern, which was matched by her vocals. It ended with a solo and fade-out on the Blippo Box, which almost seemed like a spontaneous moment. 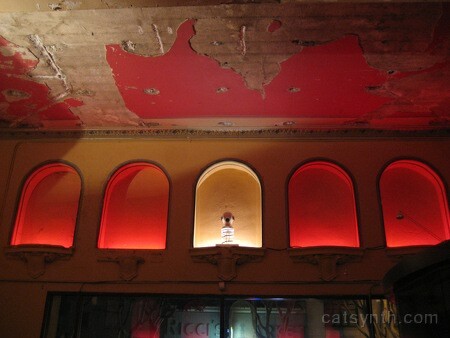 The location of the festival, the restored Brava Theater in the Mission District of San Francisco, was itself an attraction. Besides the large theater space and lobby, the deliberately weathered foyer housed the installation The Exchange by Dukoro, the duo of Agnes Szelag and The Normal Conquest. This installation with subtly placed speakers and sounds generated interactively by visitors, complemented the architecture. The Saturday performance opened with [ruidobello], aka Jorge Bachmann performing his piece Coleoptera_0909 for electronics and video. The piece centered around beetles, or scarabs, who are members of the biological order Coleoptera. Videos of scarabs were projected onto the screen. Some were crawling on skin, some were in dishes, a couple were on a corrugated cadrboard surface that resembled a Q-bert board. Initially the beetles were solitary, but then they started to appear in groups. One particular scene involved one poor scarab being madly chased and grabbed at by another (one can only speculate what was going on here). The sounds were based on recordings of natural sounds from scarabs. In the early part of the piece, the relation to the insect noises was quite transparent (i.e., it “sounded like insects”). Later on, the connection between the performed sounds and the original material became more abstract, and sounded like thick pads with delays, time-stretching and pitch-shifting effects. The piece ended with a scarab taking off in flight, and the sound following suit with an ascending glissando. 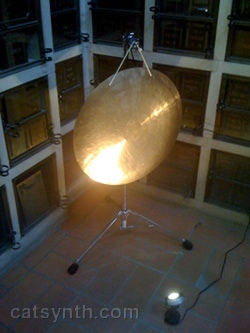 In this version, Tom Duff played Norton I and read from his various edicts, while the spoken words are processed by three electronic performers Chris Brown, Kristin Miltner and Wobbly. Indeed. all the electronic sounds were based on Tom Duff’s voice. At first, the electronic manipulations kept the words intact through various delay, pitch and time effects; but over time the electronics became more complex, with delay lines or samples short enough for the snippets from the original voice to form completely different timbres, and as such became more detached from the stage performance. I found myself focusing heavily on the video work of Tim Thompson along with the theatrical performance, and the electronic sounds became part of the background. One particularly strong visual moment was when Tom Duff/Norton I built a small “city” out of colored translucent cubes and shining flashlights through them. This illuminated construction was then picked up by the video and projected onto the screen. There was a middle section in which our protagonist appeared to go to sleep (perhaps dreaming) and the electronic music became the focus, with the video playing against the sounds (which were still entirely based on previously sampled vocal material). There was an overall calm pace to the entire opera performance, punctuated by the dramatic proclamations and occasional abrupt shifts in timbre or visuals; and one simply became immersed in the whole experience. Pamela Z concluded the festival with what she described as an “old-new sandwich” with several short pieces. The first “older” pieces included looped rhythms layered with rich vocal textures and harmonies, with one featuring a dramatic simulation of a manual typewriter complete with carriage return. There was a performance of a piece I had originally seen her perform at room: PIPES back in May. The next piece was the “new” part, a work in progress entitled Baggage Allowance. It opened with a video of a baggage carousel, with various people reciting the contents of their luggage (clothing, toiletries, books, etc.). The contents became a little more unusual over time, as people described confiscated items and even an attempt to hide a knife at LAX. A simulated x-ray of a bag included strange objects like a frog and a gun (actually, I suppose I gun isn’t all that strange). This was set against live electronic processing of vocals as well as other sounds such as the popping of bubble wrap. 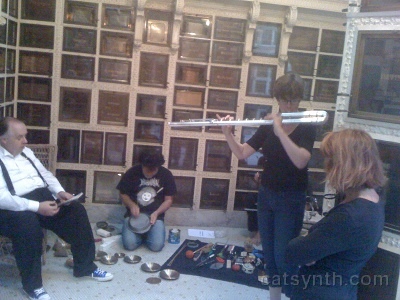 The final piece was another older work involving delays and dramatic harmonic vocals (it was originally done years ago with hardware effects boxes before being ported to modern laptop computers); as a representation of classic electronic music being redone with modern technology, it was a fitting conclusion to the festival.